Things are bound to be a little quieter on the site today with the public holiday in New South Wales, but that’s certainly not going to stop us from injecting a little pop cheer into your Monday with quite possibly the most poptastic compilation album ever released in Australia. 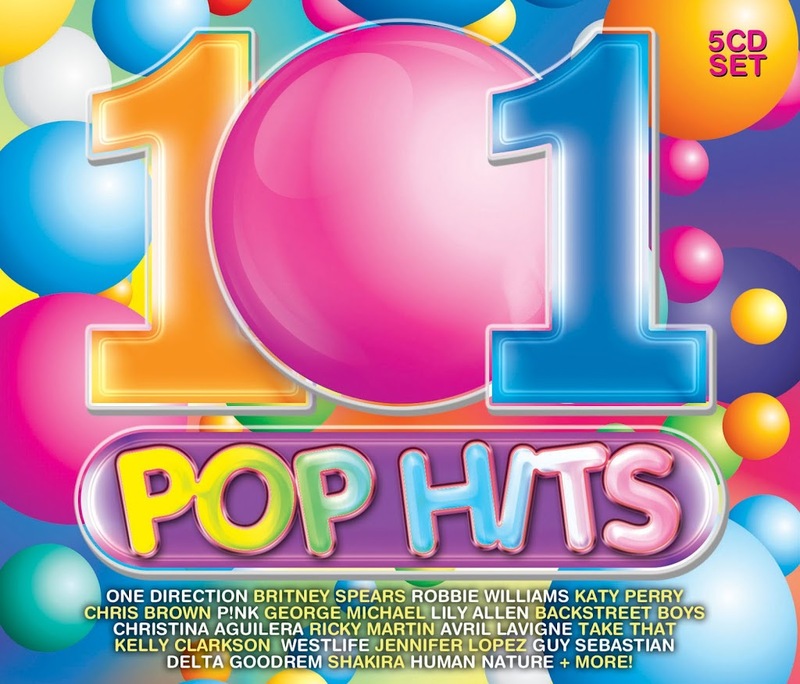 ‘101 Pop Hits’, to be released later this month, is absolutely brimming with some of the biggest hits from pop’s biggest names. The boybands, the girlbands, the girls, the boys… There are 101 amazing pop tunes spanning the ’80s, ’90s, ’00s and even the ’10s on five bulging discs. The girlbands are represented too, with Atomic Kitten, The Pointer Sisters, B*Witched, S.O.A.P., Mel And Kim, All Saints, Eternal, The Go-Gos and Shampoo (no Spice Girls or Girls Aloud sadly). But there’s a cavalcade of girls including Spice Girls Geri Halliwell, Emma Bunton and Melanie C, plus Kelly Clarkson, Ricki-Lee, Jessica Mauboy, Anastacia, Christina Aguilera, P!nk, Katy Perry, Britney, Ke$ha, Lily Allen, Jennifer Lopez, Tina Cousins, Mandy Moore, Jamelia, Kelis, Nat Bass, Leona Lewis, Delta Goodrem… the list goes on. There’s the boys – represented by Justin Timberlake, Sam Sparro, Adam Lambert, George Michael, Robbie Williams, Ricky Martin, Guy Sebastian, Mike Posner and even Rick Astley. And then there are the awesome pop bands including Empire Of The Sun, Alcazar and Steps. It’s enough to give you diabetes! Get sugared up when ‘101 Pop Hits’ lands at retail on Friday October 19. We presume the album will be made available digitally. A number of EMI’s other ‘101’ compilations are available at digital retail, so we see no reason why this one shouldn’t be there too. Will this be made available digital? S.O.A.P. – This Is How We Party. Whoa now that’s a pop mix. Nice from some Rogue Traders, Ricki-Lee, Blue to 80’s stuff of Taylor Dayne & GoGo’s. Public holiday in QLD, too :-). I think Victoria, Tasmania and the NT are the only areas that didn’t have a holiday today. I got your point in the original post, Auspop, but since Anonymous mentioned other states, I thought it best to mention mine, too :-). The artists on the compilation are brilliant (with about half a dozen head scratchers, though – Dana who?? ), although some of the tracks they’ve chosen are disappointing. I haven’t even heard of the Sam Sparrow song, and there are plenty of other Ke$ha songs that could have been included. Nat Bass has other “poppier” songs that could have been chosen. All Saints – Rock Steady? Wow… Still it’s well worth the $25 or so that they’ll be charging! It continues to disappoint me that the Big Three from the 80s (Madonna, Michael Jackson and Prince) are rarely featured on these compilations. You might see the occasional track here and there, but it’s odd that their record companies don’t allow them to be featured. Mariah Carey is rarely featured on compilations, either. It’ll be quieter specifically because of the New South Wales public holiday, because that’s where all the major labels’ headquarters are situated. They’ll all be closed, hence not much music news coming out today. 16. Thompson Twins – Doctor! Doctor! public holiday in nEw south wales? It’s in SA and WA too. Disc looks awesome too. Do you have a track list please auspop?